Last week we left the adventure paradise and enchanted gardens of Hogsback for something a little more coastal – South Africa’s very own surf heaven, Jeffrey’s Bay. This little Afrikaans fishing town was discovered in the 60’s for its unbelievably perfect waves and since then the population has grown ten-fold as surfers came to settle down with their families. The drive down along the N2 went without a hitch and although still in the notoriously “bad-road” province of the Eastern Cape, the N2 was in perfect condition and full of clean and friendly service-stations. The 330km should take you around four hours and you’ll be driving through the charming Grahamstown and the “Friendly City” of Port Elizabeth. 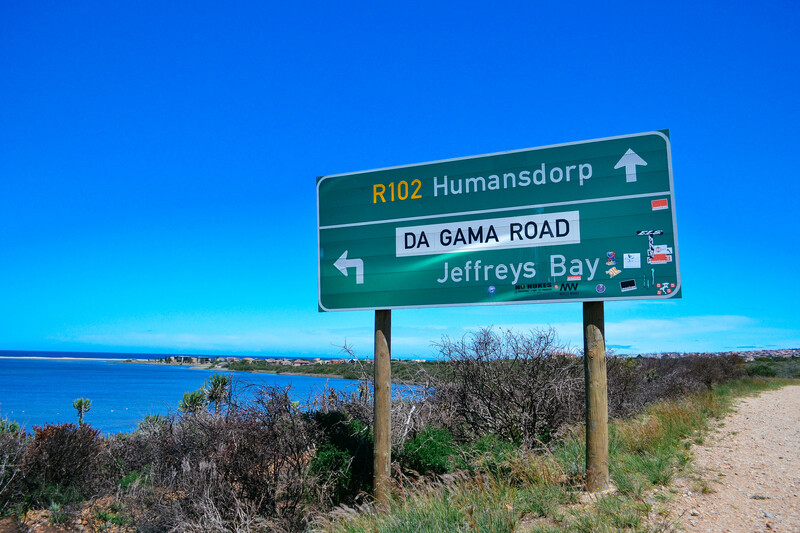 There is no sight more beautiful than when you take the R102 exit off the N2 and first lay eyes on Jeffrey’s Bay, the town is gorgeously situated on a hill sloping down towards the sea. Our very affordable and newly renovated self-catering accommodation, Aloe Again, was idyllically positioned right on Pepper Street, just metres away from one of the best right-hand point surf breaks in the world, Supertubes. Surfing is without a doubt the main attraction in Jeffrey’s Bay; here the world’s best descend to carve up the faces of the flawless waves that grace the coastline. Huge pods of dolphins cross the bay daily and can often be seen surfing the waves with the surfers! It is a truly spectacular sight. But what if surfing is not your thing? The once tiny town has expanded and now caters to all types. Activities in and around J-Bay include learning to surf (obvious! ), spending time on the plenty of immaculate beaches, swimming and sun-bathing, fishing on the beach or in the Gamtoos River mouth, visiting the Shell Museum, Going for horse rides, dining at the excellent restaurant options available, visiting the new Fountains Mall or, if you are an adventure junkie, skydiving and sandboarding! As surfers ourselves we decided that there was no better way than to spend our brief two days in Jbay surfing, making new friends, meeting old friends and drinking copious amounts of great coffee at In-Food and Nina’s Cafe. Other towns in the vicinity that are worth day trips to include Paradise Beach, Aston Bay, Cape St. Francis and of course, the millionaire’s playground of St Francis Bay. Jeffrey’s Bay is only an eight / nine hour drive from Cape Town and just over ten hours from Durban which really leaves you with no excuse not to visit. And trust me, once you’ve been, you’re sure to return. Next week, for the final article in this series we’ll be winding our way down to the Western Cape, the Overberg in particular, to wrap up our incredible enjoyable South African Road Trip. See you then!